"I'm driven by getting it right – whatever 'it' may be. I want everything to go well for the client." Jen works a lot. It’s her job to make the client look good and she puts the time in to make sure everything is done to the client’s satisfaction. 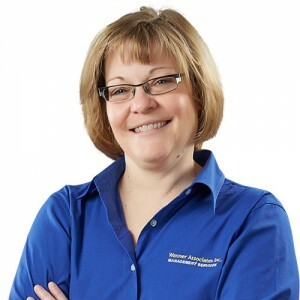 As the Executive Director for the Pennsylvania Society of Professional Engineers since 1999, she manages their quarterly newsletter, annual conference, board meetings, web content, and serves as liaison for numerous committees. She also oversees the Pennsylvania MATHCOUNTS program, which aims to make math fun for middle school children in grades 6-8. Jennifer coordinates the Governor’s Occupational Safety and Health Conference, and serves as Executive Director for the Professional Recyclers of Pennsylvania. She is extremely grateful to the entire team at Wanner Associates who make every day an adventure. Jennifer was formerly employed by the Painting and Decorating Contractors of America (PDCA) in Fairfax, VA. There, she was responsible for the national trade show and assisted with member services and the conventions for four years. Jennifer is a graduate of Juniata College in Huntington, Pennsylvania.